Are you inspired by the music of Pavarotti? Do you know where he grew up, how he started his singing career or where he trained? Are you aware of his charity and humanitarian work? If you would like to find out more about the man behind the legendary voice, this quiz book is all you need.The Luciano Pavarotti Quiz Book has been put together as a fitting tribute to one of the world’s greatest tenors. 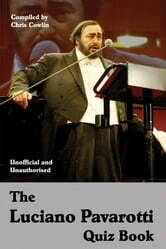 With 100 questions covering the music and influences that shaped the life of the charismatic Italian singer, including many personal details, you are certain to discover something new.Pavarotti’s remarkable voice won him an army of fans and his death in 2007 was mourned by millions of people around the globe but his music lives on. This informative and entertaining quiz book is a must-have for anyone who marvelled at the unique musical ability of Luciano Pavarotti and for all those interested in finding out more about the man responsible for bringing opera into mainstream entertainment.